All Josh has been talking about is frying EVERYTHING...including our breakfast cereal. Don't worry I didn't let it go that far:) But Josh did make Buffalo Hot Wings for the Utah game. He was beyond excited. He researched recipes, bought all of the ingredients, and did all of the work. Well, his friend John helped, but I stayed out of it! He decided to use cut up chicken breasts for the "wings." He didn't want any bones to get in the way. He wanted the wings to be nice and meaty! After rolling them in a flour mixture, he carefully dropped them into the sizzling oil! Luckily, he did this outside so the house didn't stink! After they were golden and crispy, he added the hot sauce he created. I didn't taste it but I could smell the fire!! He rolled the wings in the sauce and baked them so they were nice and crisp! Josh was in heaven! He made sure everyone at the party sampled his wings. He said they were the best wings ever. He is still talking about them:) I am glad he enjoyed them! He did a great job! Combine flour, salt, and pepper. Dip cut up chicken into flour mixture then dip into buttermilk then back into the mixture. Fry for about 5-6 minutes at 360 degrees or until golden brown on all sides. I used vegetable oil since I am allergic to Peanut Oil. Add cayenne pepper to taste depending on how spicy you like. In a small sauce pan put Franks Red Hot in pan melt the butter and then add desired amount of cayenne pepper. Then bring to boil and then simmer for 5 minutes. After all chicken is fried cover all sides of chicken with sauce. This can be done a few ways. I tried to put in bowl then pour sauce over and mix. I did not like this way because it was to aggressive and damaged the chicken a little. I then laid all of the chicken on a cookie sheet and poured the sauce over the fried chicken. Make sure all of the chicken is well covered. Put the chicken that is on the cookie sheet into the oven, pre-heated to 350 degrees. 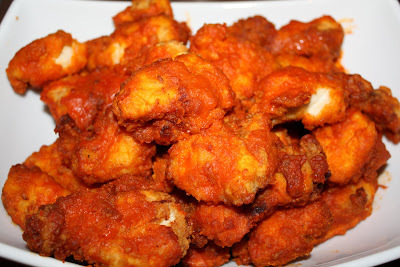 Bake the Boneless Hot Wings for 20-30 min. or until crispy! They do look good! I have a large fryer to but don't really like using it. Oh well it made him happy to use it right?! Maria that really looks good. I'm so impressed that he wanted to make them from scratch. I would probably cheat and just get takeout or use the frozen kind and pop in the oven!!! I can be a lazy cook sometimes. But I bet yours tasted way better. Oh...my husband would love these! I am looking thru your last few posts and you are a twig! How do you stay so thin? I have gained a few from blogging and cooking/baking all the time. You are giving me insentive.......maybe you are not really eating the wings/bread/gauc/pizza? Your so cute.. a deep fat fryer would scare the heebe geebees out of me too! Im glad your hubby is enjoying his new foodie toy. Thanks for checking out my tart..I hope you have a Happy New Year! 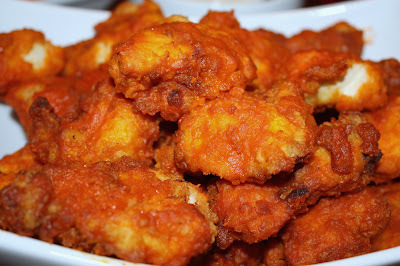 You have to admit...Buffalo (fried) chicken wings do taste delicious! They do taste Delicious! These were great! Don't worry there is nothing wrong with frying it is a fact. Franks red hot is my husbands favorite hot sauce - he would be THRILLED if I made him these. Wings and a football game - perfect! These would be great for the big game on Thursday! And I see snow and t-shirts - you guys are animals!! You'll get spoiled having a fryer and never want to go out for wings again! Maria, your post made me giggle. No, I can't say I ever would have guessed that a Fry Daddy would ever come to live at your house, given the healthy recipes you usually post! But like you said --everything in moderation! Glad that Josh likes his gift! These wings look great! Stacey-I do eat what we make..well I didn't try the hot wings because I don't eat meat, but everything else I enjoy! I just exercise and eat healthy on most days!! oh wow do those look wonderful :) Nice job! These look amazing Maria! It is btreakfast tiome here, but I could sure go a round of these for breakfast. Much more appealing than my bowl of WeetBix. WOW, these look DELISH! I remember literally eating these while in college with blue dressing of some type... but yours... OH my... did you say you had room for one more dinner? They look extremely tasty. I don't have a deep fryer but I'd welcome one with open arms. man... i wish i had a deep fryer! These look amazing! 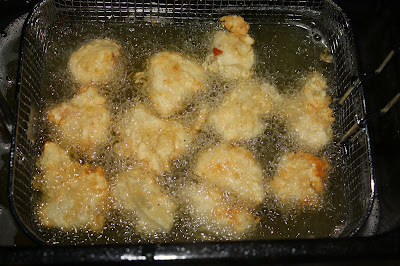 I'm a little bit scared of deep frying, both for caloric reasons and the idea of a large pot of boiling oil. That's a really cool one! Like the ones they use on Food Network. The wings look delicious! He did a great job with them. Those wings look perfectly fried and tasty! These look perfect! I'd love to put some of these away while watching football. While I refuse to own a deep fryer, I would easily cave and buy one for recipes like these. 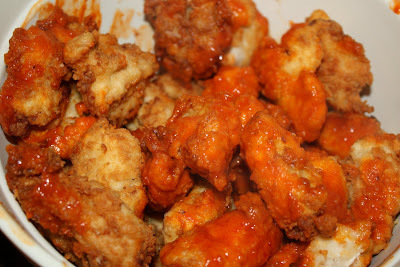 I love buffalo wings, they are such a great indulgence. 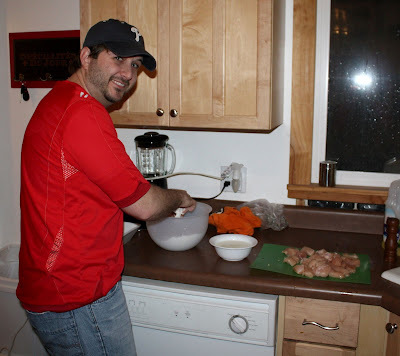 My husband doesn't like bone-in chicken, but loves spicy and loves KFC's boneless wings, what a great recipe. We have a fryer, too. Don't use it often, but I'll have to surprise him soemtime with these! The frozen oatmeal cookies sound awesome, too! It sounds delicious! Unfortunately, I love fried stuff. That's why I try not to cook it too often! You could fry rice krispie treats. Oh my God...I'm drooling. I love how you made him fry outside. 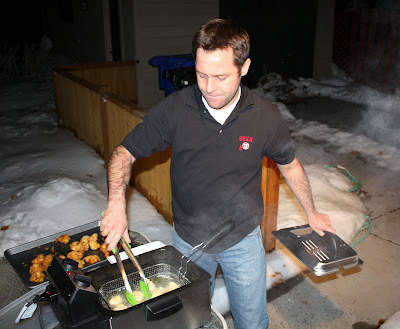 I make my husband fry outside too. Don't like getting the house all smelly. They do look delish! I must confess if I had a fryer I'd never let it go too <3 (despite my health-related profession as well ;) Then again, it must be a guy thing! I researched these for awhile and never really came up with great recipe. The most important thing is to use Franks Hot Suace. I saw one recipe that did not use any sort of liquid but they did not have pictures so I discredited it imediatley. What you could use instead of buttermilk is milk with either lemon or vinegar. I suppose you could also use egg. For everyone else Thanks for the compliments. They were great! I want to have a whole bunch of these. They look so yummy delciious. This looks great!!! I love your pictures! Oh wow, this is right up my alley. But I do love the bones in my wings for some reason!!!! Maybe because when there are no bones I eat them so much quicker, and more of 'em!!!!! It's such a small world. Elisabeth told me she was your neighbor right before you told me. Also, I'm a public health major. Where do you work? I've been trying to figure out what I'm going to do after I graduate in April. I have to admit that I have a deep fryer. We don't use it very often, but it sure is good when we do use it!! These look so delicious. 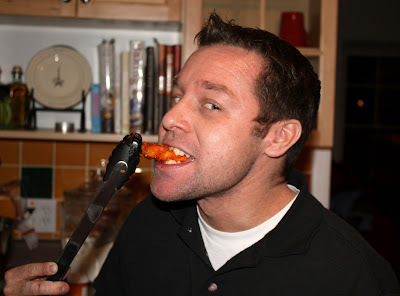 I may have to try this real soon, we love buffalo wings! 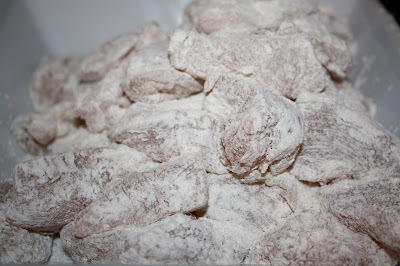 I also linked this recipe over at CityMommy. Hope it's okay.